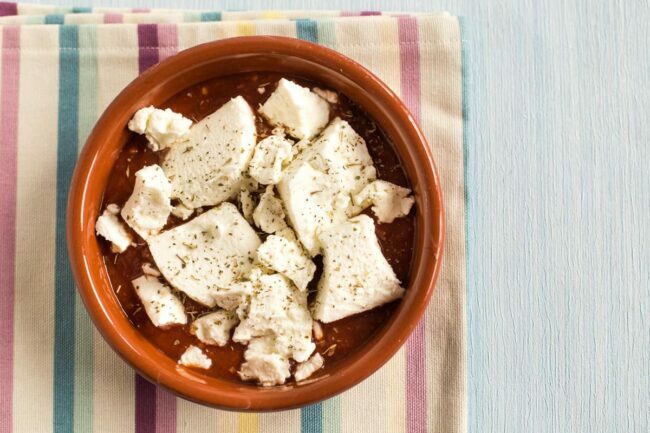 This baked goat's cheese could not be simpler, with just two ingredients. The soft and gooey cheese is perfect for dipping crusty bread! 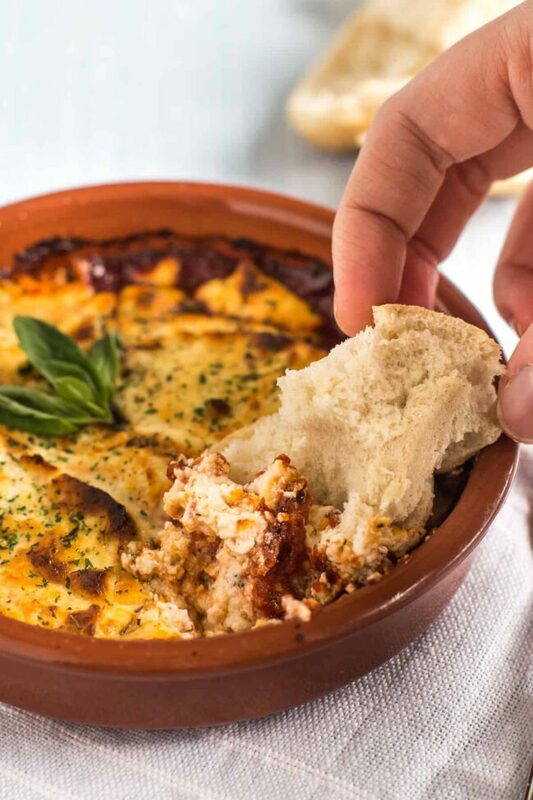 This baked goat’s cheese could not be simpler, with just two ingredients. The soft and gooey cheese is perfect for dipping crusty bread! 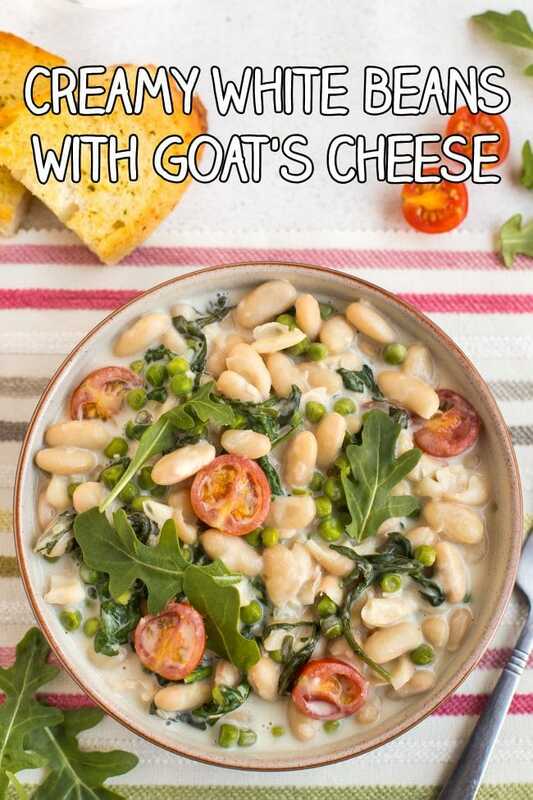 If there’s one recipe on this entire site that perfectly represents the phrase ‘easy cheesy vegetarian’, it’s this baked goat’s cheese. This recipe has TWO INGREDIENTS*. And one of them is cheese. 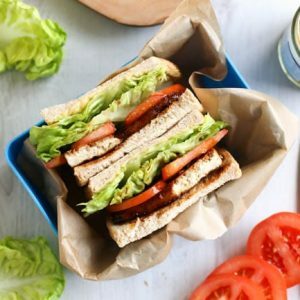 If you’ve ever wanted to eat something really incredible for lunch, but you don’t actually want to have to cook anything, firstly welcome to my daily struggle, and secondly – this is the recipe for you! 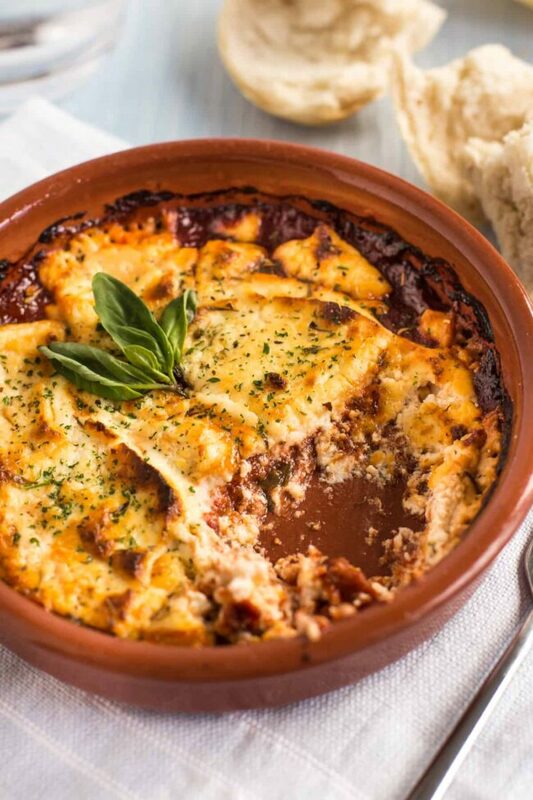 This baked goat’s cheese really could not be simpler to make. I know I’m always sharing simple recipes on this site, but I’ve really outdone myself today. The recipe basically has just two ingredients. I added a few dried herbs and a pinch of black pepper for a bit of pizzazz, but really this dish is just goat’s cheese baked in tomato sauce. 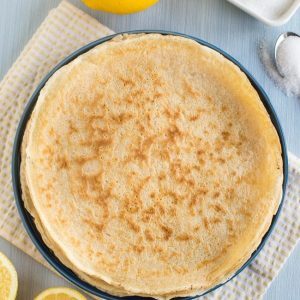 Simple recipes are the best! 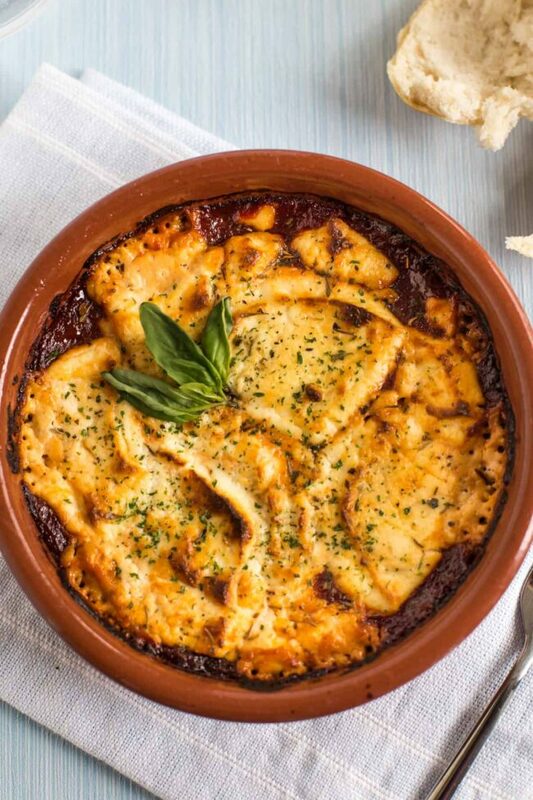 Before you go thinking that goat’s cheese baked in tomato sauce sounds a little boring, let me reassure you that often, simple recipes are far, far better than recipes that add a load of unnecessary ingredients just for the sake of it. If you know my recipes at all, you’ll know that I hate unnecessary faff! So if all you need to make an incredible meal is some tomato sauce and some crumbly soft goat’s cheese… that’s a-okay with me. 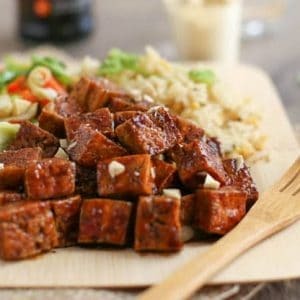 Since we are going super simple with this recipe, you’re going to want to choose decent quality ingredients. So although I often shop with my wallet, for this recipe I wouldn’t use a jar of economy tomato sauce that’s thin and watery – either buy a jar of the good stuff, or make your own. I used some more of the slow cooker tomato sauce that I shared the other day. 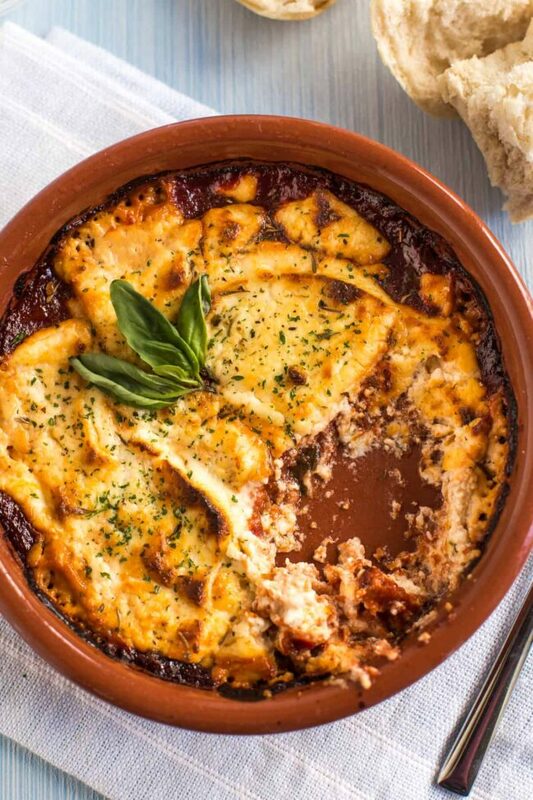 It’s rich and full of flavour, and it’s the perfect base for this simple baked goat’s cheese. As for the cheese, any good-quality soft goat’s cheese will be awesome. Just slice it up, or crumble it roughly, and pop it in the oven with the tomato sauce. The end result is really pretty incredible. The goat’s cheese melts right down into the sauce, making it unbelievably creamy (it’s so beautiful I want to cry). 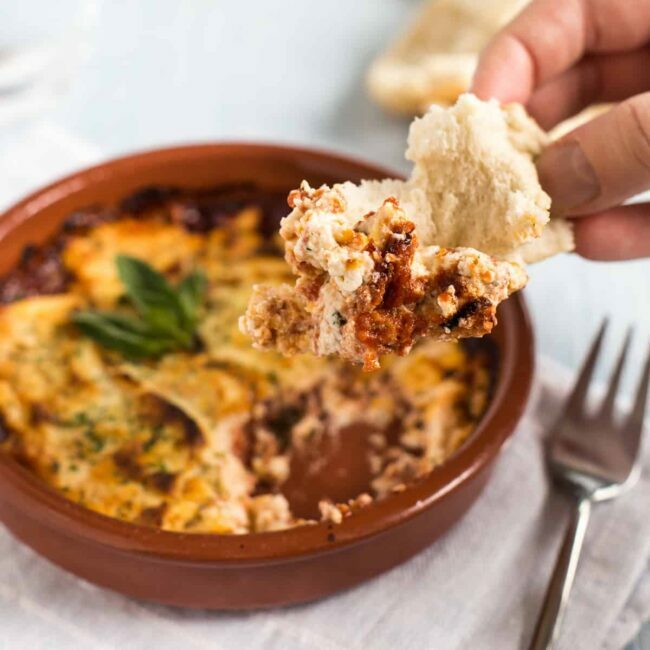 When you dip your knife in, it all mixes together into a tangy, cheesy spread – or, just forego the knife altogether and dip the bread right in there (it’s perfect for mopping up the dish). Just get some crusty bread (I love those parbaked rolls that you finish cooking in the oven – they’re perfect for this! ), tear it into pieces, and get scooping. 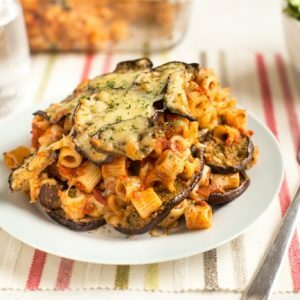 Garlic bread would be incredible with this too if you’re feeling even more decadent! 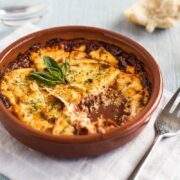 This baked goat’s cheese recipe can easily be adapted to cater for any number of people – either just one, or a whole crowd. 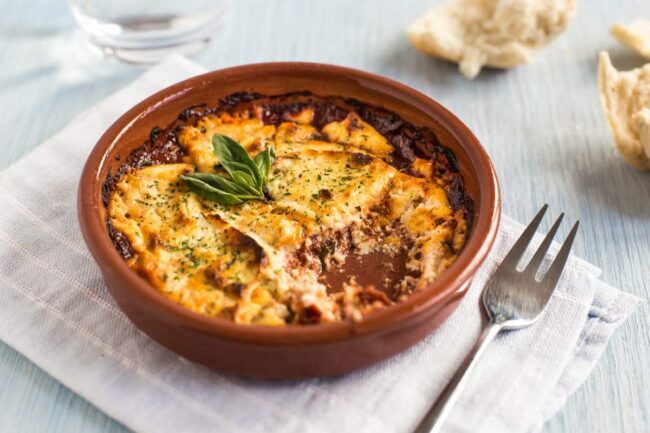 For more people, just use a larger dish and add more sauce and goat’s cheese, or make everyone their own little portion (it would be a great dinner party appetiser!). You’ll want to be pretty generous with the cheese. 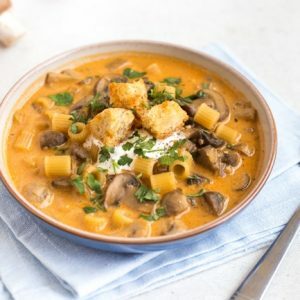 Although a recommended serving of cheese is only about 30 grams (about an ounce), that’s going to feel like absolutely nothing when it’s making up 50% of this dish – so you do need to use more than that per person. I never said this dish was light, and it’s not something you’ll want to make every single day (well… you’ll want to, but you probably shouldn’t), but if you’re going to make it for a treat, you may as well do it properly. What else could I add to my baked goat’s cheese? If two ingredients really is too simple for you, feel free to add some additional toppings to your baked goat’s cheese. You can either add some extra bits before baking, or just sprinkle over some toppings after it’s come out of the oven. Perhaps some chopped mushrooms, black olives, red onion or spring onions, toasted pine nuts, some sun-dried tomatoes, more fresh herbs… whatever you fancy. It will still be a simple dish that tastes amazing. 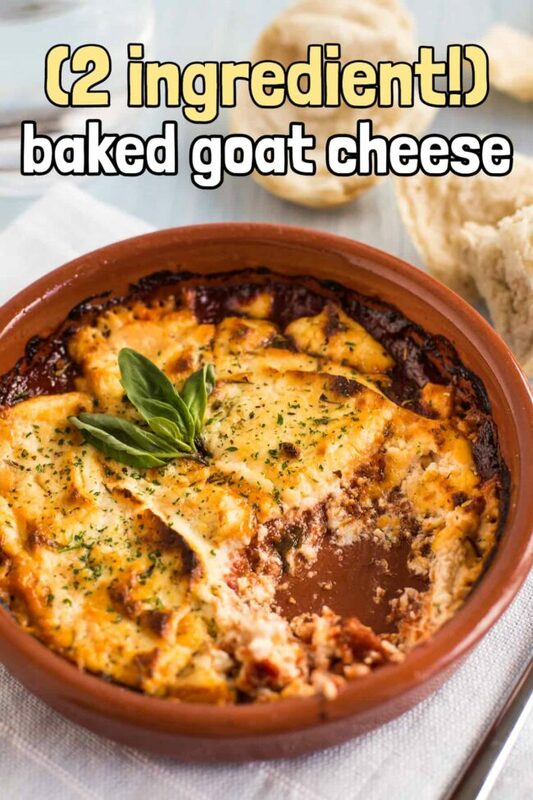 What do you think, have I convinced you that this super simple baked goat’s cheese is worth a try? Spread a few spoonfuls of sauce around the bottom of a small baking dish. Roughly crumble the soft goat’s cheese on top, and sprinkle with some dried herbs and black pepper. Bake at 190°C (Gas Mark 5 / 375°F) for around 20 minutes, or until golden brown on top. Serve immediately, with crusty bread for dipping. Note: Nutritional information is approximate, and will depend on exactly what ingredients you choose. Information above is for the full recipe, not including bread. Have a bit of goat’s cheese left over? Make these creamy white beans! My husband and I are senior vegetarians living in Australia in the country, so we get a few raised eyebrows! Our biggest problem is we looooove cheese! 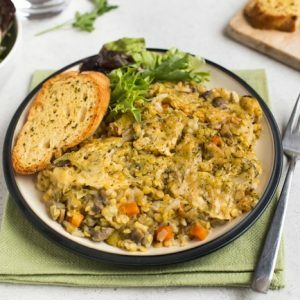 Thank you for your great recipes, we use and enjoy at least 80% of them! 👏. Maggie. You are totally right – I don’t think anyone dislikes hot, bubbling cheese! 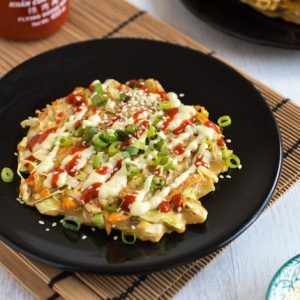 This looks delicious and I will certainly be giving it a go! that looks so amazing, and so so simple. Great ingredients really do lend themselves to being cooked simply. Oh my Becca, that looks wonderful. What a fab idea! My mouth is watering! Darn!! I haven’t eaten dinner yet and I’m just salivating over what’s pictured. What is terrible I’ve got goats cheese in the fridge — I didn’t use up all of it in a recipe I made this week. Oh my, you just can’t sub for a good goats cheese. I’m definitely making the baked goats cheese and the muffins. i have never heard of passata..but this is definitely right up my alley. It’s just sieved tomatoes, I think it might be what’s just called ‘tomato sauce’ in the US?